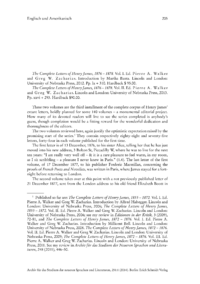 The Complete Letters of Henry James, 1876  1878. Vol. I. Ed. Pierre A. Walker and Greg W. Zacharias The Complete Letters of Henry James, 1876  1878. Vol. II. Ed. Pierre A. Walker and Greg W. Zacharias. These two volumes are the third installment of the complete corpus of Henry James extant letters, boldly planned for some 140 volumes  a monumental editorial project. How many of its devoted readers will live to see the series completed is anybodys guess, though completion would be a fitting reward for the wonderful dedication and thoroughness of the editors. The two volumes reviewed here, again justify the optimistic expectation raised by the promising start of the series. They contain respectively eighty-eight and seventy-five letters, forty-four in each volume published for the first time. The first letter is of 13 December, 1876, to his sister Alice, telling her that he has just moved into his new address, 3 Bolton St, Piccadilly W, where he was to live for the next ten years: I am really very well off  & it is a rare pleasure to feel warm, in my room, as I sit scribbling  a pleasure I never knew in Paris.. The last letter of the first volume, of 17 December 1877, to his publisher Frederic Macmillan, concerning the proofs of French Poets and Novelists, was written in Paris, where James stayed for a fortnight before returning to London.